Online Political Consulting Services to Solve Your Political Problems! Online Political Consulting to Defend Your Rights! The online political consulting is a service to help you simply solve your political problems. That is the main goal of the political consultation services online. However, there are also two other goals that may help you know much about this expertise and even use it as your own to become an expert in this field, or get in joint venture with the online political oriented consulting services I offer here. 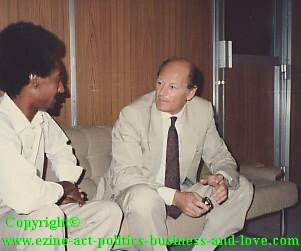 Online Political Consulting Services: Khalid Osman interviewing the UNHCR's Khartoum Representative, while engaging in the political and humanitarian issues since the eightieth. The online political consulting services here have three goals, as I mentioned. ☛ The first goal is of course offering free political consulting services. ☛ The second goal is listing already existed political consulting services on this website and/or getting in joint venture to offer online political consulting services. ☛ The third goal is to help you invest in the political consulting field online, get your own consulting firm up and active and active success in this field. Let me know first, what is your goal or what you had in mind when you came to this page. Use the form at the bottom of the page. There are three questions here this page answers, all of which makes the three goals I mentioned above. What kinds of Political Consulting you're looking for? What kinds of Political Consulting you can get at the Ezine Act's politics, business and love? What kinds of Political Consulting you can generate out from our Ezine Act's, politics, business and love experiences? Since this page is about to answer the first and in conjunction the second question and concentrate on them, the answers of the second question, with conjunction with the third questions are in the following three links. You can get and generate political consulting services when you list your online political consulting services using the simple listing services at the consulting services here. For the joint venture, you can use the form on this page to write your application for a joint venture in online political consulting services with the Ezine Act. Provide, in this case, your CV and the specifications of your political consulting services. At the same time, you can generate online political consulting services when you read carefully how to make your knowledge sell using the CTPM PROCESS and understand it well. At this stage, you will discover not only the complete process to do that, but also the techniques and the scientific methods to become an expert in your field. Getting now to the main purpose of this page, let us ask how those online political consulting services could solve your political problems. Well, the scope is not as wild as it seems to be in the specified political consultation services on the Ezine Act's, Politics, Business and Love. I'll be specific and up to your desire and of course expectations to acquire some of the best fundamental methods to solve any problem in this regard. I consult you and write your appeal, when your political authority infringes one of your basic human rights. See the basic human rights within the article on the political consulting services page here. If your labor's rights abused, I consult you on what to do and how to treat in this matter until you solve that problem. You should provide the main labor's proclamation of your country in this regard. If your country has not authorized the labor's proclamation, this would be a political problem. In this case, I will advise you on how to deal with such issue. In addition, I offer online political consulting services to political refugees whether they are in the area of the crises, the surrounding areas or even in the new resettlements in Europe, America and Australia. I had been a political refugee myself and I know this issue from within, (i.e. political situations, cultural backgrounds, personal circumstances, refugees' applications processing, resettlement treatments, international obligations in the lights of the 1951 conventions and the 1967 protocol). However, I do not offer this online political consulting through direct contact with political refugees in the areas of the crises; although I do some phone calls, I should say to eliminate the confusion. See the refugees's section at the HOA's Humanitarian Network. Moving the Online Political Consulting to HOA! This kind of consultation services I could offer from the HOA website to some channels dealing with the issue, or through refugees' personal contacts they know abroad who have access to request advices. It also runs through the specified procedures above. Regarding the same issue, I offer direct online political consulting to political refugees who have access to request these consulting services through some people they know abroad, whether they reside in the new resettlements in Europe, America and Australia or not. I do not think it is that much extended consultation. More over, I offer online political consulting services to those politicians who want to make their countries in the Horn of Africa better by solving the existed political problems. This concern may extend to the entire African continent. That is because I have strong political perspectives and I understand the political problems of the African countries as journalist. Continue at the political consulting services page. See Environment, Khalid Osman's Network, My Journalism Experiences and Formal Measures of Intelligence to be more confident. Share the political consulting with your social media services and the other services you see on the small buttons on the page. Thanks.